Thank you all so much for your fabulous responses to my last post! 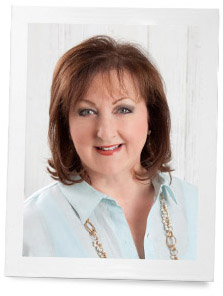 I am thankful that we share similar interests and can inspire one another here on this blog. You all provided such wonderful suggestions, and I can’t wait to write about these topics. One suggestion was place card idea­s—both formal and informal! And since Easter is right around the corner, what better theme to cover. 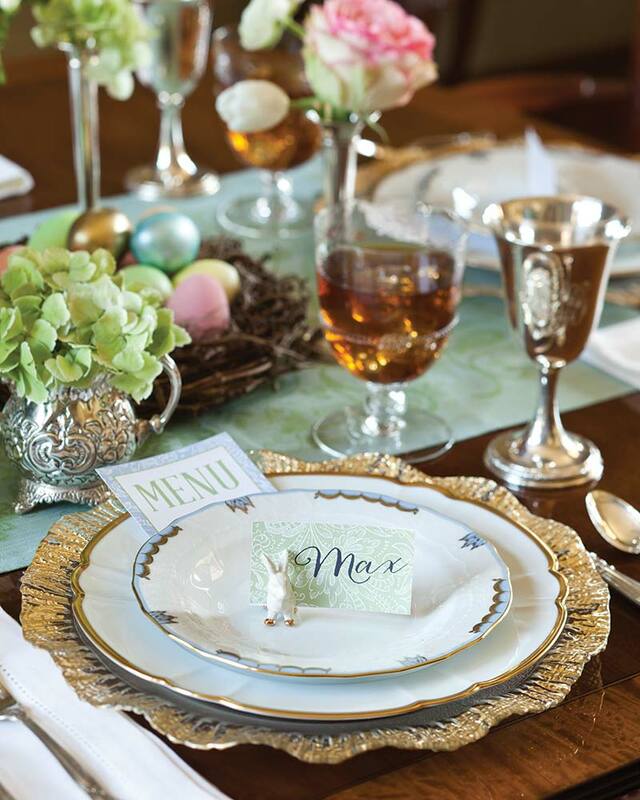 The beautiful place setting ideas that I am sharing today embody the colors of spring and the joy of Easter. 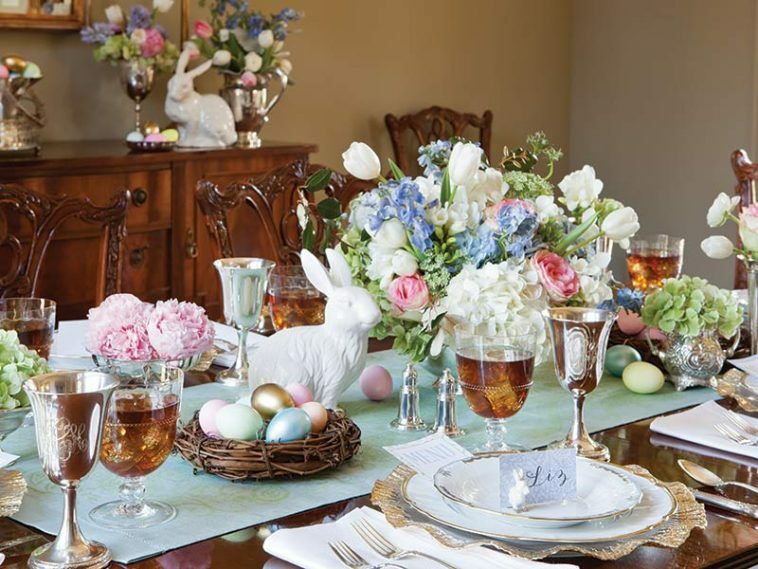 I don’t know about you, but gathering with loved ones for Easter lunch is something I always look forward to, and I just love making small changes to my table setting each year. Switching up the place card is a wonderful way to incorporate something new without buying all new table décor. I think you’ll love these three easy yet elevated ideas for your Easter place cards! For a place card holder, look for bunny magnets at your local craft store. Paint the feet gold to tie in with the rest of the décor. Create playful place cards by writing names on pastel eggs and settling them in a little nest. 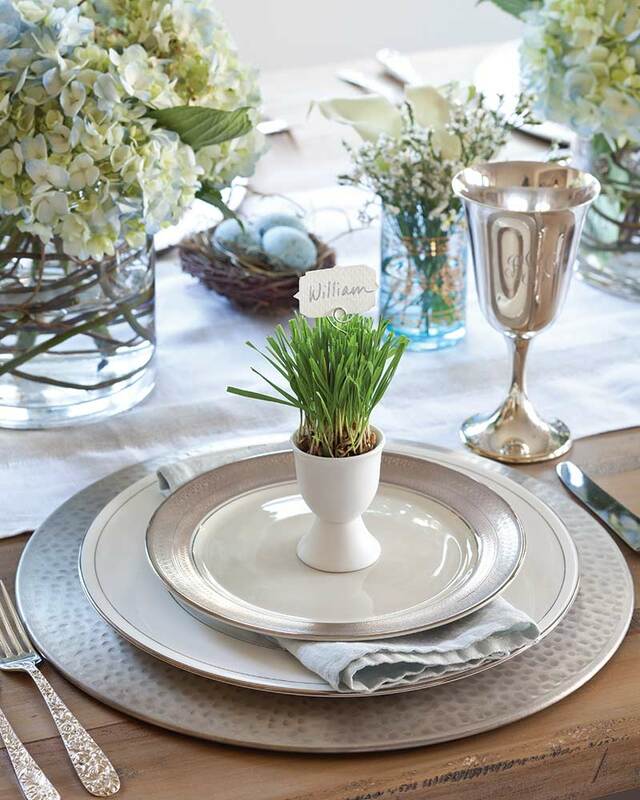 Tuck wheatgrass into egg cups and insert the place card and stand directly into the soil. All of these supplies can be found at your local craft store. 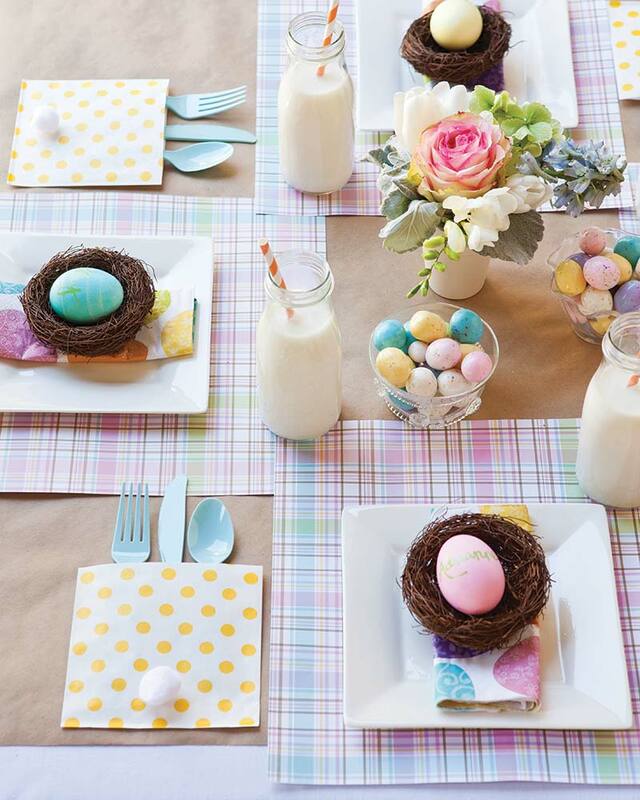 What is your favorite way to decorate your Easter table? Beautiful! I love the children’s table…especially the eggs in the nest. I might use that for the adults too! Instead of flowers for the table, I often put herbs in a big mason jar…bunches of parsley, thyme, dill etc. I am of Ukrainian background so the table will also include Ukrainian Easter eggs, called pysanky. Please tell us the name and where we can find those great beverage glasses in the first pic! I’m thinking they’re Juliska. And the engraved pewter is just stunning! I love the idea of the grass in the egg cups! One of my favorite ways of decorating is with natural materials and Spring flowers cut from my mother’s yard. Your table settings are beautiful! I used to have fresh flowers on the table for Easter each year. We have discovered that several family members have allergies to the flowers so I place fresh greenery and fake forsythia or hydrangea down the center of the table. Then I add a pop of additional Spring color with table napkins. If Easter weather is pleasant enough to enjoy the meal on our back porch, we gather fresh tulips for our centerpiece. Even the family members allergic to flower pollen can tolerate the tulips for a short time. This year though I’m thinking of asking my daughter to create some origami Spring flowers and grasses for the Easter table. That way , we’ll have some creative beauty that no one will sneeze at! So elegant and appropriate for Easter and Spring. Thank You for the ideas and suggestions. I love all the different ideas. Lovely to look at. Lovely setting . So pretty and festive. All of these are wonderful! We have an Easter buffet here at FrenchGardenHouse for all our friends and family after church, but I do like to set a small table for “just us” to eat breakfast on Easter. Love. Love. And love! What sweet ideas! Great ideas! I even like the children’s table ideas for our main table.